I remember that once Imam’s wife had gone on a journey, and Imam was missing her very much. In short, however much we teased Imam, he would not stop frowning. 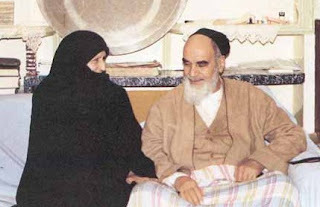 Imam had extraordinary respect for his wife. 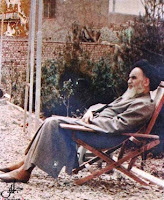 For example, I am not lying if I say that in the period of 60 years of living together, he did not even reach for food (on the dinner table) before his wife, nor did he have even the smallest expectation from her. I can even say that in the period of 60 years of living together, at no time did he even ask for a glass of water, but would always get it himself. He behaved this way not only with his wife but also with all of us who were his daughters. If he ever wanted water we would all enthusiastically run to get it, but he never wanted us to bring and give him a glass of water in his hand. ‘How is Khanom?’ We would reply: ‘She is good.